DUP LEADER ARLENE Foster has said that the City of San Francisco’s posthumous award to Martin McGuinness, which cites his “courageous service in the military”, has caused offence. Foster said that the reference has caused “a great deal of pain and offence to many people within Northern Ireland”. 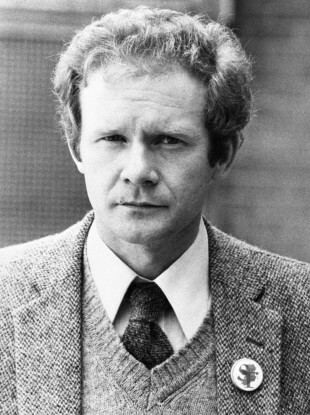 “In the later part of his life, Martin McGuinness undoubtedly played a very important role in the restoration of devolution. That peaceful political role was an important part of his life, but the earlier part of his life was one of violence,” Foster said. Arlene Foster served as First Minister and McGuinness as Deputy First Minister before the Stormont Assembly collapsed over two years ago over the cash-for-ash scandal. Foster said that she had written to the British Consul General in San Francisco, Andrew Whittaker, who serves as the equivalent of an ambassador for the US city. The award was signed and approved by the Mayor of San Francisco, London Breed. It is important the people of San Francisco know something of the reality of IRA terrorism and I have asked the Consul General to pass on a letter to Mayor Breed which details some of the IRA’s activities and makes an offer for her to visit Northern Ireland and see how that terrorism still causes pain today. The award was signed on Friday, 8 March, although it states that it was honoured “on the occasion of the National Day of Ireland”. Foster said that when McGuinness was a commander of the Provisional IRA Derry, “the towns of Claudy and Coleraine suffered indiscriminate car bomb attacks”. These were bomb attacks which murdered pensioners and young children, a reality of IRA terrorism which is likely to be unknown to the Mayor of San Francisco. Email “Foster slams US mayor's award that pays tribute to McGuinness's 'military service'”. Feedback on “Foster slams US mayor's award that pays tribute to McGuinness's 'military service'”.